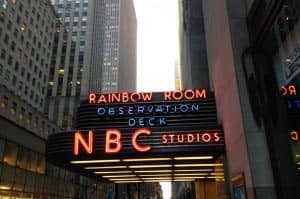 The NBC Studio Tour in New York is great for those who really like TV shows such as The Today Show and Saturday Night Live that are big in America. On this tour you will be able to go behind the scenes and see the famous studios of a variety of American TV shows. The guide will also show you some of the most famous movie locations in New York. The tour starts with a guided tour through the streets of New York. You’ll see some famous TV and film locations. The guide will help you to discover the scenes of some of the well known shows and films. After the tour you will continue on a visit to two of the official production studios. These are the studios where shows such as Saturday Night Live and Tonight Show are shot. You then continue on to the audio and video studios and control centre of the NBC and you will be introduced to the production process of a tv show. The highlight is when you get the opportunity, together with the group, to create your own tv show segment. It will be emailed to you later too. Eric’s Tip: This tour is interesting for those who like American TV shows. Personally, if this isn’t the case I would skip this tour. Also, I wouldn’t advise bringing along children unless they are fans too.